Meditation For Beginners Online - Are You Doing It The Wrong Way? I get a lot of people asking me about their meditation practice and if they are doing it the right way or not as they don’t seem to be getting any benefit from it. The first thing to understand about meditation is that there’s nothing really complicated about it. I call it the art of doing nothing because if you can sit, walk, run, eat or do anything while being present in the moment, then you are meditating. There’s nothing special required except to be present. The more present and aware you are to what is happening both within and around you, the more meditative you become. So the mind and body can go on ‘doing’ whatever it likes but if you can stay centered and be present, then meditation happens automatically. 1. Meditation is what happens when you stop being distracted. It is a state of peacefulness and stillness that comes from being present. It doesn’t require any fancy methods or techniques to make it happen as it’s a natural state of being. 2. Let go of any expectations around how your meditation should look or be. Even sitting for a few minutes while your mind is chatting away and your body is fidgeting can still yield results because the mind cannot always know what is happening beneath the surface. 3. Meditation can happen even when you’re not expecting it like when you go for a run and get into the ‘zone’ – that is meditation. Or, when you feel really happy for no reason at all and your mind is at peace – that is meditation. Or, even when you day dream and lose some time – that is meditation. 4. Because meditation can be done while sitting, standing, moving, or even laying down, it’s easy to do anywhere and anytime. No special equipment is required as you can use your breath, your body, or even an object to help you stay focused and centered. 5. Consistency is the key. If you are going to give meditation a go, then you need to be consistent with it. Just like going to the gym and training a muscle to get stronger, the more you devote some time to meditate each day, the more your meditation mind will grow. 6. If you get bored while your meditating try some other meditation techniques until you find one that works for you. There are thousands of meditations to try so it’s highly likely you’ll eventually find one that is perfect for you. Once you find it – keep using it. 7. If all else fails and you still find meditation doesn’t work for you, then most likely you are stuck in a pattern of judgment and rather than stressing yourself out – quit while you’re ahead. Even though meditation can be done by anyone, it doesn’t mean that it is for everyone. The great news is that the benefits from daily meditation will happen even if your mind tries to tell you that it’s not working. All that’s required is to do 5 or more minutes a day. If you can commit to that then you’ll be well on your way to a happier, calmer and more centered life. 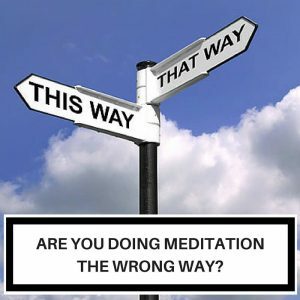 https://www.meditationdojo.com/wp-content/uploads/2016/04/Are-You-Doing-Meditation-The-Wrong-Way-Featured.jpg 274 640 Michael Atma http://www.meditationdojo.com/wp-content/uploads/2017/01/Meditation-Dojo-2017-5-300x77.png Michael Atma2016-04-21 06:42:552016-10-11 03:28:24Are You Doing Meditation The Wrong Way?